I’ll write soon about some fun recent work I’ve done, but for now thought I’d distract you with some of my favorite personal shots taken during this crazy summer that has been both maddeningly wet and stiflingly hot at times. Still, we managed to get out and enjoy the outdoors and our vegetables did grow, finally! Enjoy. 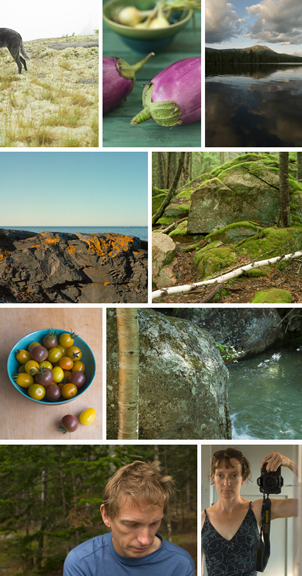 Clockwise from top left: The hindquarters of Clara, our dog, in an abandoned quarry in Stonington; gorgeous eggplant from Freedom Farm; a view of Mt. Katahdin from Daicey Pond, where we camped for my birthday; the extreme greenness of the Barred Island Trail in Stonington; the incredibly beautiful and frigidly cold Katahdin Stream in Baxter State Park; a rare self-portrait at Reid State Park (something about turning 40 made me think I should do this! ); my husband, Scott, pondering life while waiting for morning coffee during our trip in Baxter; a recent cherry tomato harvest from our garden; and lovely lichen at Two Lights State Park. This entry was posted in food, landscape on August 25, 2009 by Stacey Cramp. All but one of these shots are beautiful. Excuse me, but where is the shot of my wonderful stew in my grimy white kitchen? Relax, Crampy. I did this BEFORE the CT trip. There is still a chance it will make an appearance!